The governments of the self-proclaimed republics in eastern Ukraine have agreed to postpone their local elections, thus fulfilling the wishes expressed by the leaders of Russia, Ukraine, Germany and France at talks in Paris on Oct. 2. The two republics, which had previously slated local elections for Oct. 18 (DNR) and Nov. 1 (LNR) have moved the votes to Feb. 21, 2016 following a meeting in Paris on Oct. 2 between the leaders of Russia, Ukraine, Germany and France at which the parties called on the Donbass to cancel these elections. The desire of the DNR and LNR to hold elections independent of Ukraine's general elections had impeded the implementation of the peace agreements signed in Minsk in February, which stated that elections must be held in accordance with Ukrainian law, i.e. on the same day as elections throughout the country. 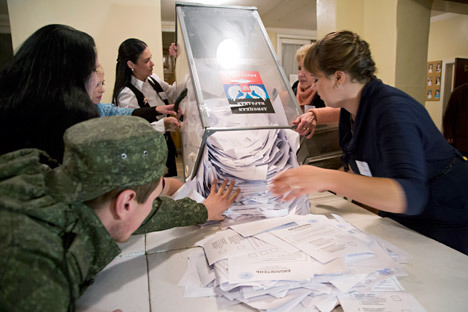 Ukrainian local elections are scheduled for Oct. 25. Kiev had stated that the DNR and LNR's autonomous organization of local elections would have led to their failure, and EU figures had inferred that further sanctions against Russia could follow if Moscow did not apply pressure to the pro-Russian rebel republics to cancel the elections. Announcing the postponement, the representatives of the rebel regions said that the departure from the initial dates of the local elections is linked to "Kiev's complete implementation of Minsk-2's political points." The republics expect that Kiev will be ready "to assign the Donbass a special status, prevent the prosecution and punishment of participants of the events on the territories of the Donetsk and Lugansk regions, and introduce amendments to the constitution, giving it a new version, one that takes us into consideration." Ukrainian President Petro Poroshenko announced that Donetsk and Lugansk's agreement to postpone their elections "opens the door for Ukraine’s return to the Donbass with the help of elections held according to Ukrainian legislature and OSCE standards." However, speaking in front of parliament on Oct. 7, Ukrainian Foreign Minister Pavel Klimkin called the move by the DNR and LNR "a dirty game," insisting that at the meeting in Paris the parties had agreed on the complete cancelation of elections, not their postponement. He also said that, "nature does not have a special status for the Donbass," and that elections can be held only after "the removal of foreign troops" – a reference to the Russian forces that are widely believed to be supporting the two breakaway republics – and that amnesty can be granted only after the elections have taken place. Moscow welcomed the decision by the self-proclaimed republics. "This is another example of the flexible and constructive approach towards realizing the Minsk agreements," said presidential press secretary Dmitry Peskov. Pavel Svyatenkov, collaborator at the independent Institute of National Strategy, called the decision by the DNR and LNR a "unilateral concession" to Kiev. "Ukraine has promised to realize the Minsk agreements on many occasions – grant amnesty, adopt a law for local self-government in Donetsk and Lugansk, introduce amendments in the constitution and so on, but nothing of the sort has been done yet," he said, underlining that he does see any signs of Kiev changing its position. Ukraine crisis: Is there a light at the end of the tunnel?